The Stage and Camera views are the centre of operations in Storyboard Pro. In these views, you can build, draw, paint, animate the camera, create layers, and see your results. ‣ In a view area, click the Add View button and select Camera or Stage. The main area in these views is where you do all your drawing and painting. In this space, you can display the grid and safe areas, navigate the interface, and access the Colour Picker to choose colours. The status bar is located at the bottom of the Stage and Camera views and is displayed by default. The status bar contains shortcuts to tools used most often during the animatic stage of the storyboarding process. NOTE: These tools are not available in the status bar of the Camera view: Thumbnail, Camera Label, Complete Camera Path, Look at Selected, and Point of View. NOTE: You can hide the status bar in the Stage view if you need more space for your work. In the Preferences dialog box (press Ctrl+U (Windows) or ⌘+ , (Mac OS X)) select the Camera tab, then deselect the Show Status Bar option in the Options section. Displays the thumbnail of a selected panel. Displays a grid in the Stage and Camera views. The default size is the standard 12-field animation grid, but you can choose another. You can also select View > Grid > Show Grid or press Ctrl+G (Windows) or ⌘+G (Mac OS X)—see About Drawing . Shows or hides the TV safety zone and the centre of the camera frame. The safe area adapts to the scene resolution, as well as the safety zone and frame’s centre. You can also access this feature from the top menu by selecting View > Extras > Show Safe Area. You can define your own safety limits in the Preferences dialog box—see Camera Preferences. You can also select View > Extras > Show 4:3 Safe Area. You can also select View > Extras > Show 4:3 Area. You can also select View > Extras > Camera Mask. Shows or hides the IN and OUT indications in the top-left corner of the camera frames, on the start and end position of a camera move for the current panel. When the Camera tool is selected, the labels switch to alphabetical labels that clearly show the different camera keyframes—see Animatic on page 1. Displays all the related camera keyframes and paths in a scene. When this button is deactivated, the Stage view displays only keyframes that are contained in a panel. You can also access this feature by selecting View > Show Complete Camera Path. NOTE: This option is not available in Camera by Panel Compatability mode. Resets any panning, zooming or rotation done in the Stage view and returns the display to its initial settings. You can also select View > Reset View or press Shift+M. NOTE: This option works with the Camera and Stage Views. Resets any rotation done in the Stage or Camera view and returns the display to its initial rotation settings. You can also select View > Reset Rotation or press Shift+X. When rotating 2D layers in 3D space, you may find that the Stage view is no longer perpendicular to a drawing layer, making it impossible to draw on it. This option makes the Stage view perpendicular to a selected drawing layer, allowing you to draw on it. NOTE: This option is used when working in 3D space—seeAbout 3D Objects. The Point of View menu lets you determine the level at which the current position of the Stage view (zoom, pan and rotation) is remembered when you flip through the panels. The current Point of View mode will also affect the different Reset View commands’ behaviour as they will reset according to the Point of View mode.—see Point of View Menu. Lets you enlarge or reduce the Stage or Camera view display. If you want the camera frame size to always match the size of your Stage view, select the Fit to View option. Displays the name of the selected layer of the current panel. Displays the name of the selected tool. If you override a tool using an overriding keyboard shortcut, the tool’s name turns red—see About Drawing. Displays the currently selected colour in the Colour View . You can click the colour swatch to open the Colour Picker and select a new colour. The Layers list is where a scene’s layers are superposed to form the final image. When you import an image or draw in a panel, you are actually adding artwork to one of its layers. By default, each panel has two layers, a background (BG) and a foreground layer (A). As you add layers, they are automatically assigned subsequent letters in alphabetical order, but you can rename them. They are also placed on top of the selected layer or at the very top of other layers if there is no layer selected in the panel. Adds a vector layer to the Layers list. Adds a bitmap layer to the Layers list. Duplicates selected layers so you can quickly copy and paste in one operation. Unlike copying a layer, you cannot paste multiple copies of a layer on other panels. 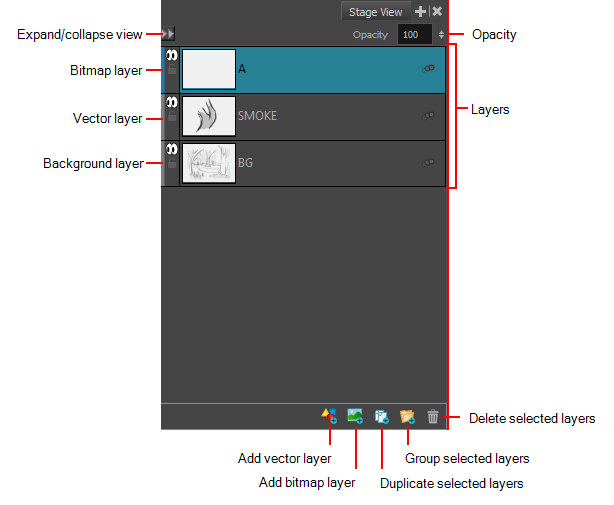 Duplicating layers is only available within one panel. Duplicated layers retain their names and are appended with a number. Groups selected layers. The grouped layer isnamed Group and appended with an underscore and a number. For example, Group_1. Each time you created a group, the number is incremented. Select Edit > Preferences (Windows) or Storyboard Pro > Preferences (Mac OS X). Press Ctrl+U (Windows) or ⌘+ , (Mac OS X). In the Preferences dialog box, select the Camera tab. In the Options section, select the Show Status Bar option to display the status bar. Deselect it to hide the status bar. ‣ In the status bar, click the Zoom Factor button and select a zoom level. ‣ Roll the scroll wheel of your mouse to zoom in and out of the Stage view. NOTE: You can also do this in the 3D workspace in the Camera, Top, and Side views. 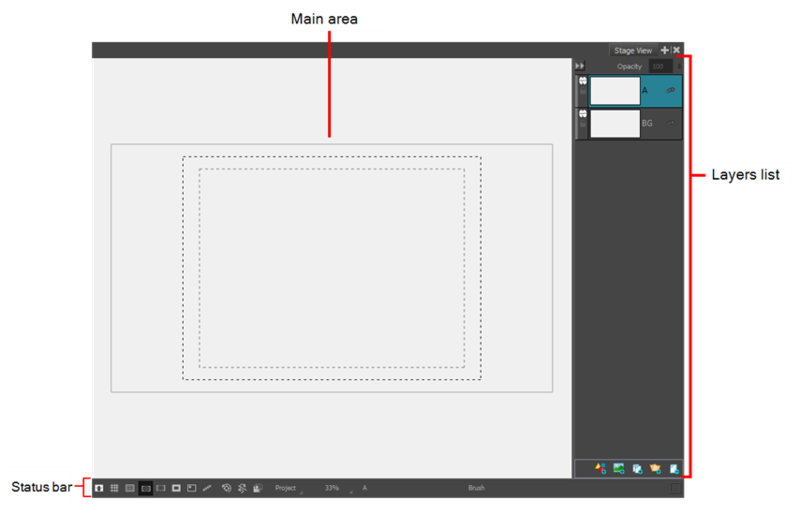 ‣ Default Drawing Area to display the entire drawing area. ‣ Current Panel Overview to always reset the view to fit the camera, regardless of the point of view mode. ‣ Camera Overview to display the current panel from the camera's point of view. ‣ Start Camera Frame to display the panel of the first frame in a panel. ‣ End Camera Frame to display the panel of the last frame in a panel. Use the Camera tool when you want to make any changes to the framing of scenes or panels. You can find the Camera tool in the Tools toolbar or from the top menu (Tools > Camera). You will use the Camera tool to move the Static Camera and also when you are setting keyframes to animate it over time.